I met up with my friend David at Woodbridge station to go and visit some churches on the Bawdsey Peninsula. David is the enthusiastic churchcrawler in extremis - I think I am pretty committed exploring Norfolk when I live in Suffolk, but David lives in the American state of Colorado, and his trips to the flatlands of East Anglia begin with a journey of coming on for 5,000 miles. Obviously, he has a solid run of a couple of weeks of them at a time. Given that, in general, the churches of the Bawdsey Peninsula do not rank among Suffolk's most exciting, it was very good of him to be accompanying me on what had started a dull and dreary October Saturday. I had cycled through the back lanes from my house in Ipswich, and all the way I was wondering which way it was going to go - would the clouds clear, or would the murkiness entrench itself? As it would turn out, we would see plenty of sunshine that day, but in fact the mists and gloom rather suit this parish, which historically ranks among the most fascinating in Suffolk. 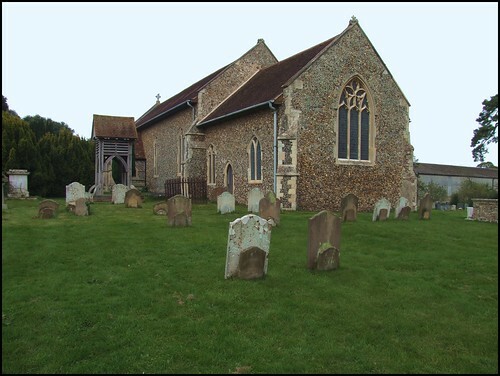 It is unusual for a village to have a building of greater antiquity than its parish church, but the age of the largely Victorian-rebuilt All Saints at Sutton pales into insignificance in comparison with the barrows at Sutton Hoo, to the north of the village. Here, during the 1940s, Basil Brown of Ipswich Museum excavated a huge Anglo-Saxon ship burial, probably the final resting place of Redwald, King of East Anglia. The treasures are now in the British Museum, the burial helmet most familiar among them. It is easy to imagine Redwald's final journey across the heathland from Rendlesham, to this wild bluff overlooking the Deben. And it is possible to visit the Sutton Hoo site, where there is a fascinating museum and excavations are still in progress. But All Saints is also worthy of investigation. So often, you see a fine medieval church, and go in to the crushing disappointment of a complete Victorianisation. All Saints at Sutton is quite the opposite. This mainly Victorian church conceals one of the finest and most interesting fonts in the county. There is nothing quite like it in all East Anglia. It has the eight orders of the pre-Reformation church around the base, figures representing deacons, priests, bishops and the like. The supporting angels corbelling the bowl have, between them, the instruments of the Mass; paten, chalice, missal, and so on.The figures on the bowl are the four evangelists, interspersed with Gabriel and Mary at the Annunciation, Mary Magdalene, and a very rare God the Father, the old man himself, seated on his throne. The rest of the church is neat and pleasant enough, a typical work by Richard Phipson, one of his earliest in the county. And even if he hadn't refurbished it, there wouldn't be much that was medieval left here, because the whole thing burned down early in the 17th century. One survival of the fire is the brass inscription to William Burwell, who died in 1596 at the age of eighty. He would have been witness to the whole turbulent process of the Reformation, and the forging of early modern England. The brass is now mounted on the west wall, which makes it easy to view, but also means that it would not survive a fire today. There is some very good glass from the Clayton & Bell workshop in the nave and chancel, although the east window design by William Warrington is perhaps rather less to the taste of the modern age - Sam Mortlock kindly described it as 'lively'.The rood loft stair opens quite high in the north wall, and must have been an impressive sight in this narrow, aisleless interior. The chancel roof beams are picked out nicely between white plaster, which becomes a ceilure in the nave with just the main beams showing, which is very effective. The difference creates the effect of a wide and spacious chancel. The Millennium project here was a little wooden belfry that stands to the south of the chancel. It replaced a previous smaller turret, and is rather more ambitious than the one at nearby Alderton, but it seems a shame that you can't see the bell inside. But all in all, what a super little church this is. Today, it is little-known, I suppose, but any ghosts that might be here would have instantly recognised David's American accent: we are only a mile or so here from the northern edge of the former USAF Woodbridge base, with Bentwaters beyond that, and during the Cold War these lonely lanes reverberated to the sounds of Air Force activity. It seems strange to think of it now.